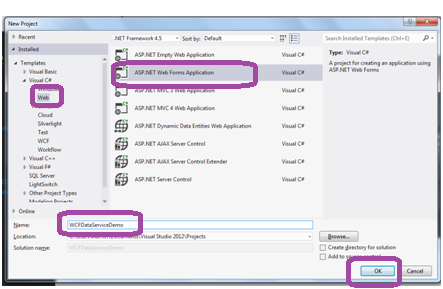 In this article we will focus on how to create a WCF Data Service. First we will create a WCF Data Service in a Web Application. Then we will access this service from a Windows based application by adding reference to this DataService in the Windows based application. 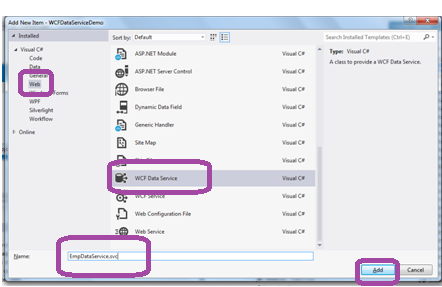 In this article we will focus on how to create a WCF Data Service using Visual Studio 2012. First we will create a WCF Data Service in a Web Application. Then we will access this service from a Windows based application. 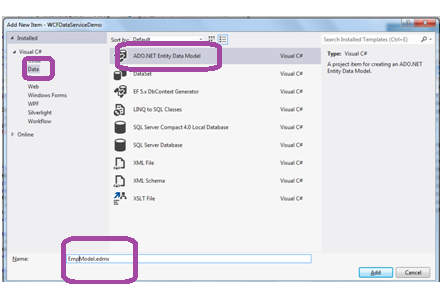 Step 1:Launch Visual Studio 2012 -> File ->New Project -> ASP.NET Web Forms Application -> Name: "WCFDataServiceDemo"
Step 2:Right Click Project -> Add ->New Item -> Select Data on right side -> Select ADO.NET Entity Data Model. 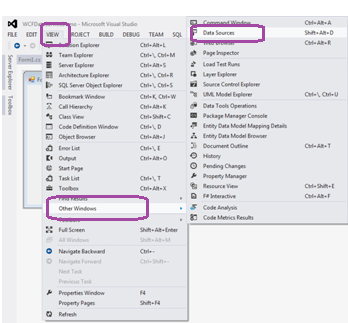 Right Click Project -> Add -> New Item -> On the Left Side -> Under Visual C# -> Select Web -> On the Right side scroll and select "WCF Data Service"
-> In the Name Field type: "EmpDataService.svc" -> Add. This adds the DataService to the project and opens the EmpDataService.svc.cs file in the Visual Studio code editor window. Now you can see the below line. Which implies that the WCF DataService inherits the DataService class. This indicates that all the tables are accessible to all users. Now Build the Web Forms Aplication and Press Ctrl +F5 this open the XML schema for the service. 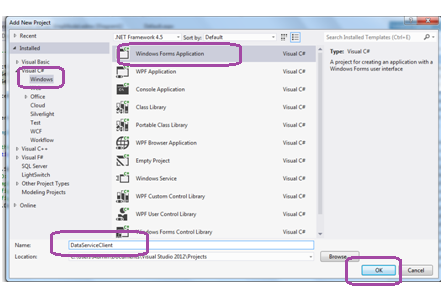 Right click the Solution -> Add -> New Project -> Windows -> Windows Forms Application -> Name: DataServiceClient -> OK . 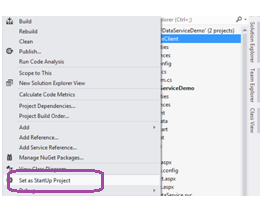 Right click DataServiceClient project in the solution -> Select "Set as StartUp Project". 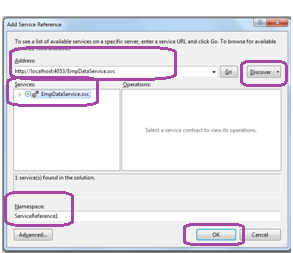 Right click the DataServiceClient project -> Add Service Reference -> click on Discover -> Under Services select "EmpDataService.svc" -> This displays the URL of the service in Address field. Click on OK.
Go To View menu -> Other Windows -> Data Sources -> This opens the Data Source window. 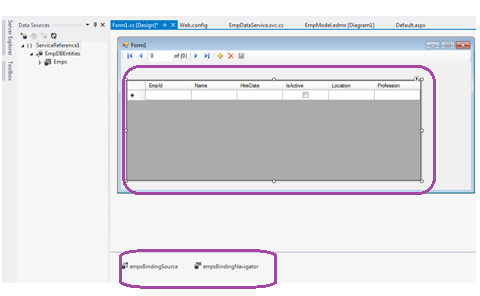 Now Drag and Drop the Emps DataSource to Form1. This adds three controls to the Form: A DataGridView control(empsDataGridView), a BindingSource component(empsBindingSource),a BindingNavigator component(empsBindingNavigator). Now Double click on the Form(Form1) and in the Form_Load event handler add the below code. 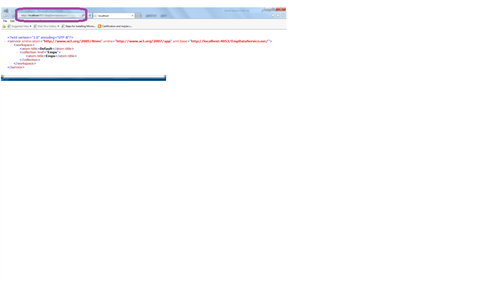 In the WCFDataServiceDemo project -> Right Click "EmpDataService.svc" file and select View in Browser. This displays the XML schema of the dataservice in the browser. Now copy this url and paste it in above code in the new Uri constructor. Press Ctrl +F5 to run the application. This displays the webform with the Emp details.